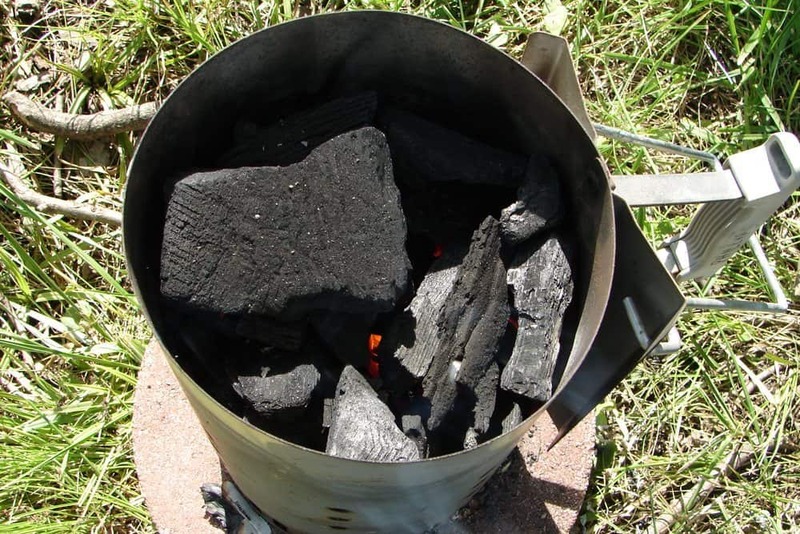 There are many ways to light the charcoal for your charcoal smoker but I highly recommend using a charcoal chimney starter when performing this task. 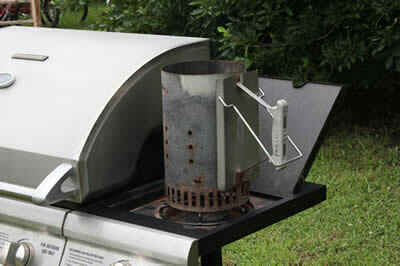 If I can go a step further, allow me to recommend the ones made by Weber as they are larger and more durable than most of the other brands that I have seen available. 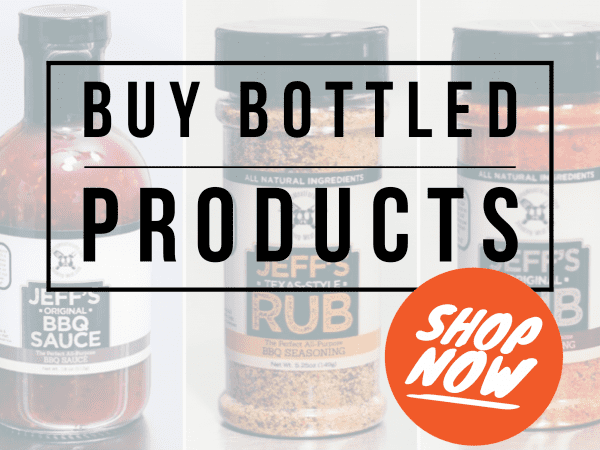 You can find these at amazon.com or you might also be able to find one at Ace Hardware, Lowes, Home Depot, etc. 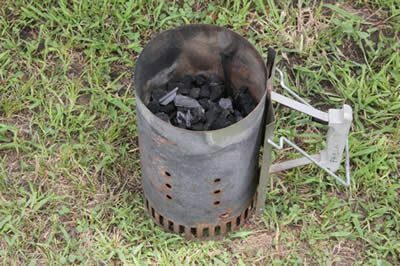 A charcoal chimney starter looks like a big metal cylinder with a handle. Upon closer inspection, you will notice that it has a wire frame bottom, intentional holes in the sides and a recessed area in the bottom. All of these details are part of the design and are what makes it work so well. 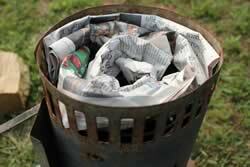 Roll a section of newsprint into a burrito then place a couple of these into the recess as shown. 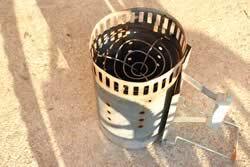 Turn the charcoal chimney over onto a hard surface or on top of the grate for safety. Fill the chimney with charcoal about 3/4 full for best results. 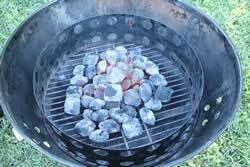 I prefer using lump charcoal but briquettes are just fine as well. 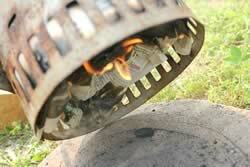 Light the paper through the holes in the bottom sides and let it sit and burn for about 7 minutes. 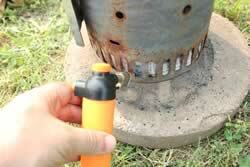 Let it burn for about 7 minutes or until the fire is coming out of the top and the coals are glowing orange. Note: yes, I know these are briquettes all of a sudden while the above pictures are lump. For some reason, I lost the pictures of the finished lump charcoal so I used the pictures from another session where I used briquettes. 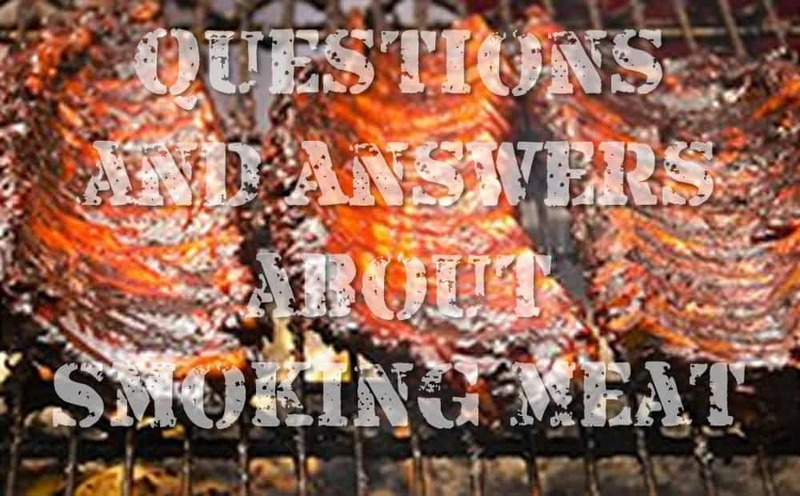 Pour the charcoal into the smoker and you are good to go. 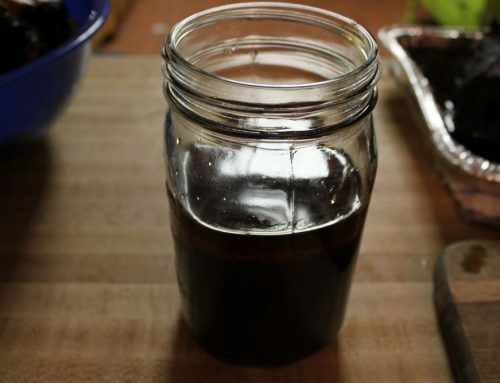 If it needs another batch, that can easily be done by repeating the steps above. 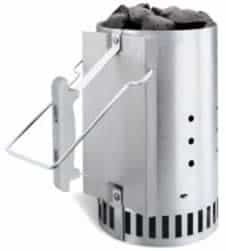 Using the chimney starter makes it very easy to get the charcoal smoker or grill going without the need for lighter fluid or other flammable liquids. 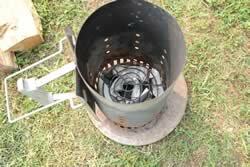 This is also perfect for the minion method where you place unlit charcoal in the bottom of the firebox and a batch of lit charcoal on top. 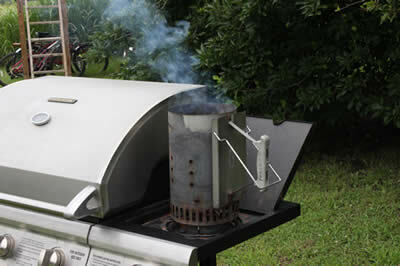 Newby here…going to smoke 2 chickens this weekend…would you say that one chimney container of hot coals will do the trick (is that enough for about 3 – 4 hours) and about how much wood chips would you use…I know I have had brisket with entirely too much smoke flavor that ruined it and I don’t want that to happen. 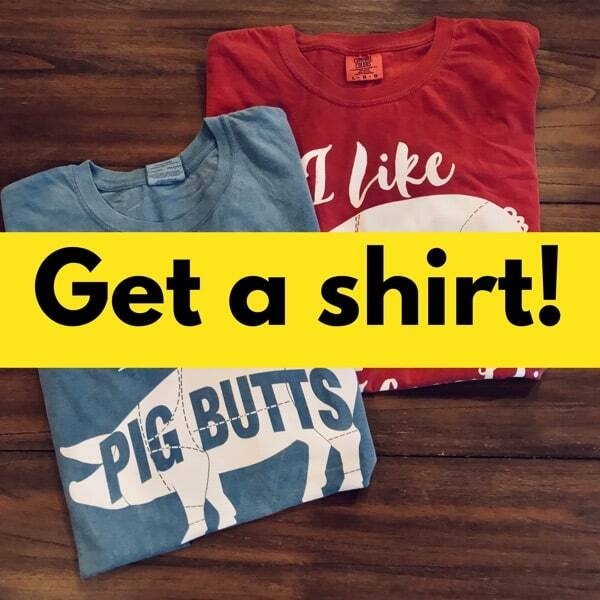 Is there a standard measurement to start with and then I can adjust next time to my taste? 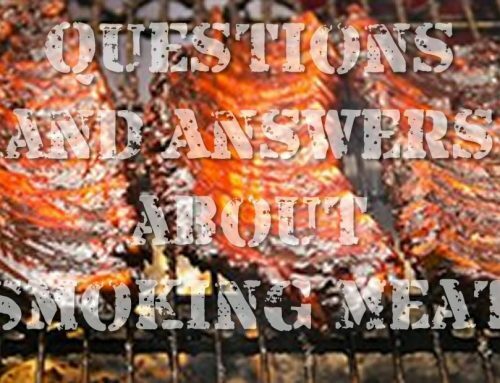 Nadia, This is not an easy question since every smoker has a different burn rate for charcoal depending on how well it holds in heat. 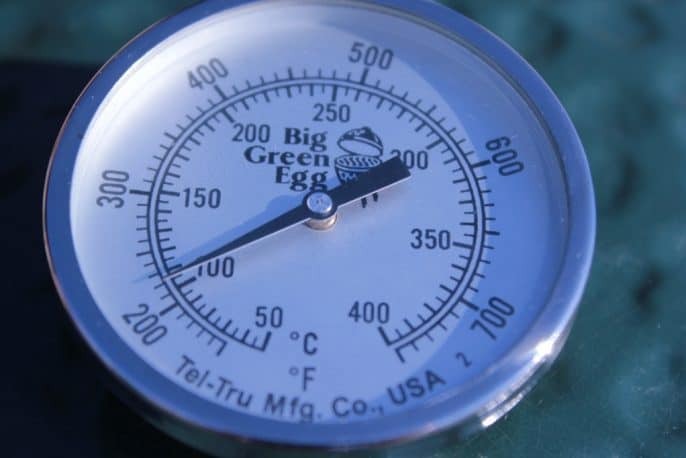 What type of smoker are you using and what temperature are you planning to maintain? 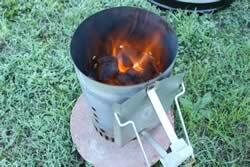 I’ve been using a Charcoal Chimney Starter for years with great results. 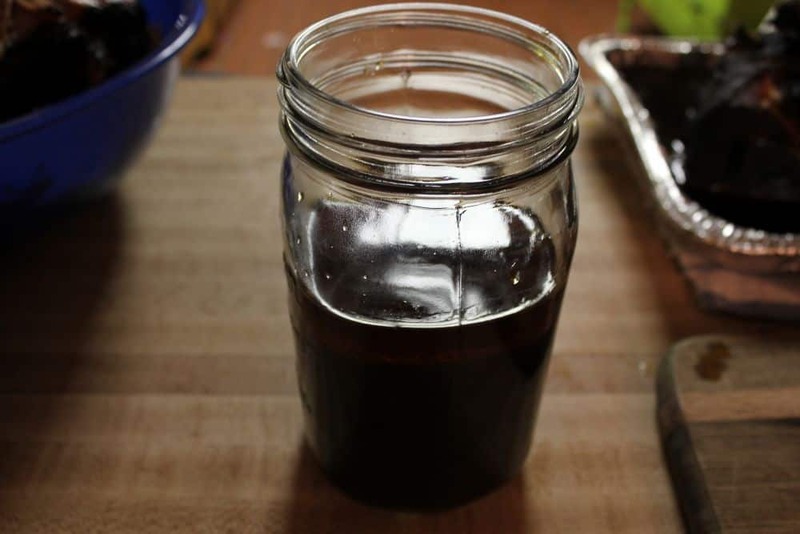 Easier than electric starters and no chemical taste/residue from that stuff in a can. All I use is 1 sheet of newspaper. 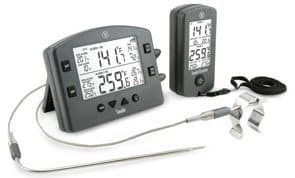 I use the cheapest one I can find, but I do admit the heat shield and handle are not great, so I need to use a BBQ glove after it heats up. I’m sure the one linked in the article above is made of higher quality material, but in my view they all work the same. YMMV. I had completed this article and i love it. Thank for sharing, I wait the next article in this subject. Thanks ! Thank you so much for the website its really so educational. 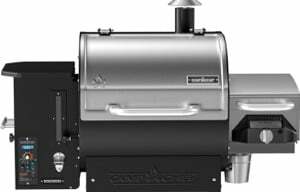 How could I go about making a drum smoker? I must say you really explain all your recipe’s and instructions exstremely well, it’s a pleasure to follow your directions. 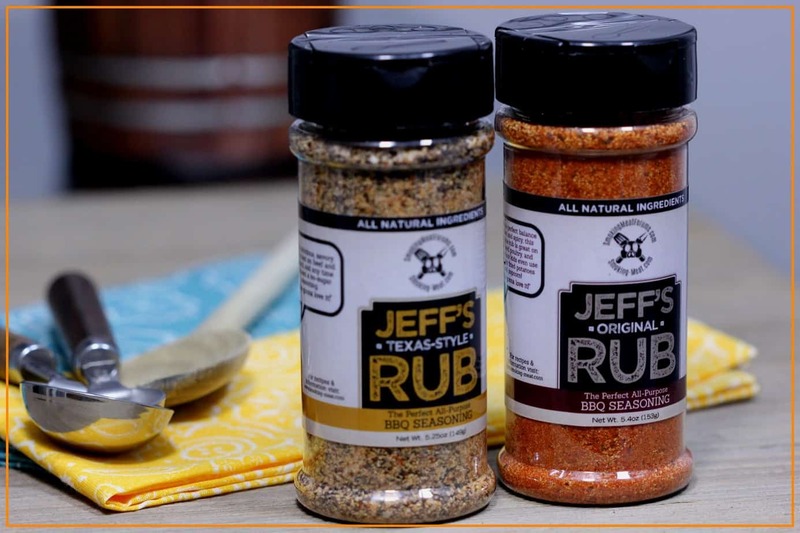 Thanks Jeff for making things easy and understandable. 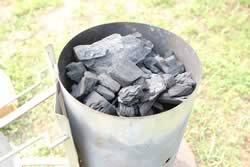 i got a master forge charcoal smoker, is it a good idea to cure it before i use it? 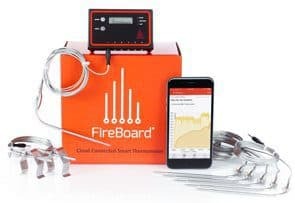 we are new to smoking with this. 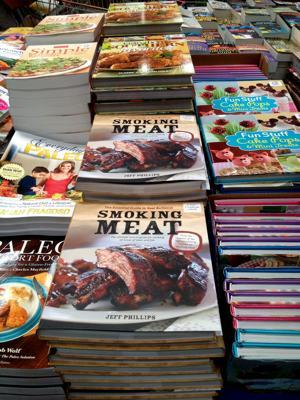 going to purchase your book, need lots of direction.